Imagine the ocean as home. Haddock, lobster, jellyfish, porpoises, sharks. Neighbors. Wings without feathers— flippers— gliding, guiding. All I did was imagine— crammed under the granules of siliceous rock. Brothers and sisters piled in a heap. Until one day. We boiled up out of the nest. One by one, we skittered across the pebbly sand. One by one, we scooted to the vastness. Sea turtles swim, eat, and sleep in the ocean. The females travel to sandy beaches to lay eggs, and then they head right back to the salt water. As soon as the babies hatch, they work their way out of the sand and move toward the ocean. Let’s see what you know about sea turtles! Can you match the sea turtle with its fact? 1. Leatherback sea turtle 52”-70” 550-2000 lbs. 2. Kemp Ridley sea turtle 24”-28” 80-95 lbs. 3. Green sea turtle 32”-48” 144-450 lbs. 4. Olive Ridley sea turtle 24”-31” 85-100lbs. 5. Hawksbill sea turtle 30”-35” 95-165 lbs. 6. Loggerhead sea turtle 34”-49” 176-440 lbs. 7. Flat Back sea turtle 30”-39” 154-198 lbs. ___My large head looks like a log. ___I am the largest sea turtle. ___I eat green sea grass and algae that makes my fat green. ___I float in the sea and let birds sit on my smooth table-like shell. ___I am the smallest sea turtle. ___My mouth is shaped like a bird’s beak. I use it to find food in small spaces. ___There are more sea turtles like me in the ocean than any other kind. Leatherback sea turtles would rather eat jellyfish than jelly on toast. If sea turtles lived on the land, they would need eyeglasses. Their eyes are made to see in the ocean with perfect vision, but once they leave the ocean they are nearsighted. If you see a sea turtle crying, they are not sad. They are emptying extra salt water from a gland behind their eye. 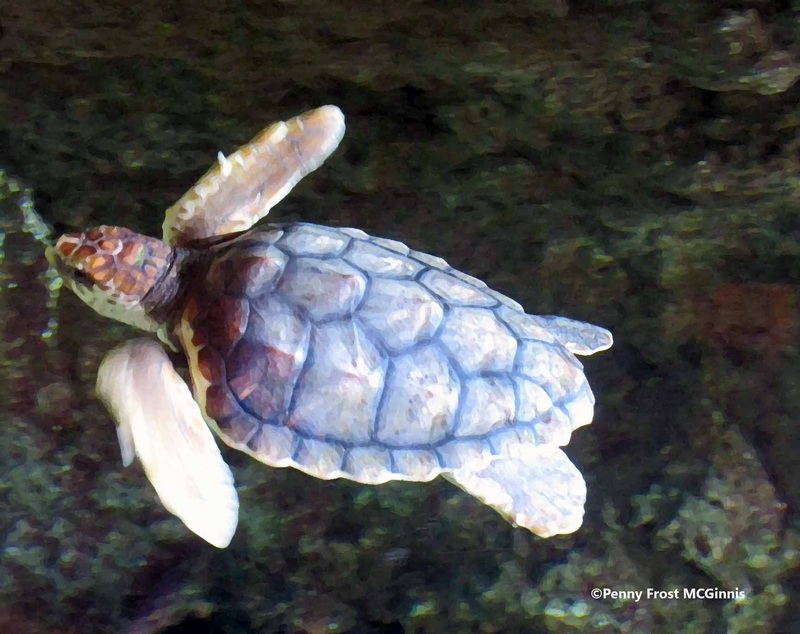 Sea turtles flap their front legs like a bird flaps its wings. They fly through the water like a bird flies through the air. Some leatherback sea turtles measure as long as a person does tall. They can grow up to 6 ½ feet tall. Green sea turtles don’t take bubble baths to get clean. They let the ocean’s cleaner fish slurp off their grit and grime so they look sparkling clean. Even though the black sea turtle looks black, it is considered part of the green sea turtles’ family. *Answers: 6, 1, 3, 7, 2, 5, 4. "Marine Turtles." NOAA Fisheries Services. 2008. NOAA's National Marine Fisheries Service. 03 Mar. 2008 <http://www.nmfs.noaa.gov/pr/species/turtles/>. "Sea Turtle Information." North Florida Field Office. 31 Aug. 2007. U.S. Fish and Wildlife Service. 01 Mar. 2008 <http://www.fws.gov/northflorida/SeaTurtles/seaturtle-info.htm>. Spolita, James R. Sea Turtles : a Complete Guide to Their Biology, Behavior, and Conservation. Baltimore: Johns Hopkins UP, 2004. 24-119.